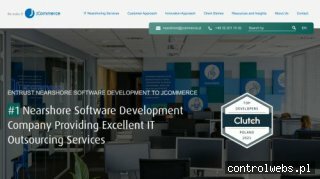 Opis: JCommerce is a modern IT company that has been specializing in making its clients happy since 2005. We provide services to the representatives of the following economy sectors: IT, telecommunications, banking, finance and insurance, manufacturing, trade, services and public administration, while our offer includes: IT outsourcing, Business Intelligence, portal systems, mobile SFA systems and customized solutions. JCommerce co-operates with the world leaders of modern IT technologies, such as: IBM, Microsoft and SAP BusinessObjects. Thanks to this we offer software that is technologically sophisticated and ideally suited to our clients’ requirements and expectations. Biuletyn informacji publicznej od firmy E-Line.